You know how you can be plodding along, focused on the task(s) at hand and suddenly you're stopped dead in your tracks? I have a long list of things I feel like I need to accomplish and I've been trying to make my way through them in an orderly and logical fashion. I felt completely in control - until suddenly I wasn't anymore. 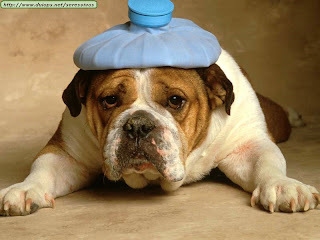 On Wednesday, after dutifully working out (another check on the list), I came down with a horrible migraine. For half the day Wednesday and the entire night, I was in so much pain. If you've ever had a migraine you understand the feeling - you're sick to your stomach, you can't handle the slightest light or sound. In addition, my neck was bothering me so I couldn't lay down on it. Pain medication didn't help either. So I was propped up against a mountain of pillows in the dark with an ice pack across my eyes just praying for it to go away. It finally eased enough by morning for me to move around, but it left me feeling tender. I knew that if I wasn't ultra careful, the pain would come right back. And although I hate feeling so sick, I find that I need these occasional reminders. I get so focused on what I can do and what I can control that I sometimes forget that it's all an illusion. I'm not in control. No matter how much I plan or schedule, things happen that derail all my efforts. It's then that I remember that only God is in control and His is a perfect plan. I can relax and breathe easier knowing that. I'll continue to make my lists and plan my days, but I won't get bent out of shape if they don't go the way I want them to. At least for the near future. Until I become so caught up again in me that I take my eyes off Him. So although the last couple of days were unpleasant, I'm grateful for His gentle reminder. And this small and temporary trouble we suffer will bring us a tremendous and eternal glory, much greater than the trouble. For we fix our attention, not on things that are seen, but on things that are unseen. What can be seen lasts only for a time, but what cannot be seen lasts forever. Dee... I am just now getting back to blogging and I hate to hear you havent felt well. Hope you are feeling much better.